Inder Loves Folk Art: Maggie's choice. Hello again! As promised, I'm back with Maggie's choice, in all its pepto-pink glory! 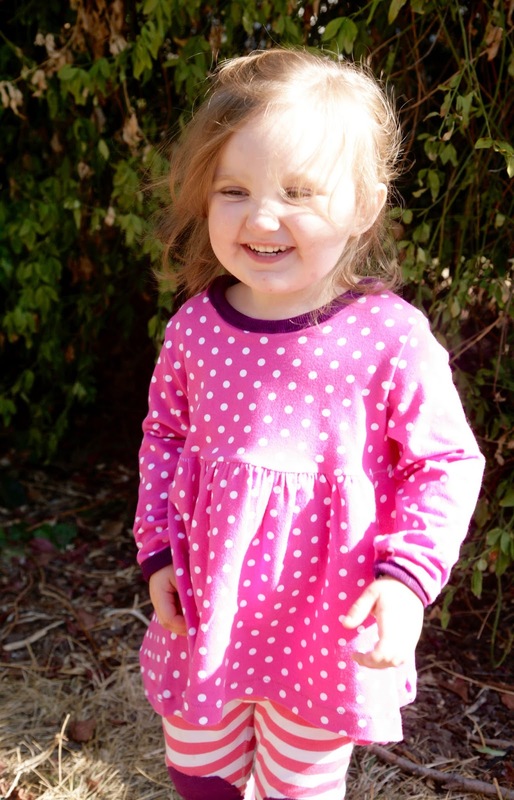 Directed to the cotton knits at Stonemountain, Maggie chose this very, very bright pink polka dot Laguna knit, enthusiastically dubbing it "Minnie Mouse Fabric"! I went back and forth on what to make with it, and decided to peruse my Ottobres for ideas. Ottobre Magazines are packed with excellent patterns - and they are especially an amazing resource for sewing with knits. The sheer variety is almost overwhelming! There are so many adorable patterns, but when I stumbled on this page of Issue 6/2013, I knew I had found the one! I like that's it an autumn/winter appropriate outfit, has a Hanna Andersson aesthetic, and that adorable model in her boots sure doesn't hurt, right? I just so happened to have some Riley Blake lycra jersey in pink stripes in my stash, so we were ready to go! 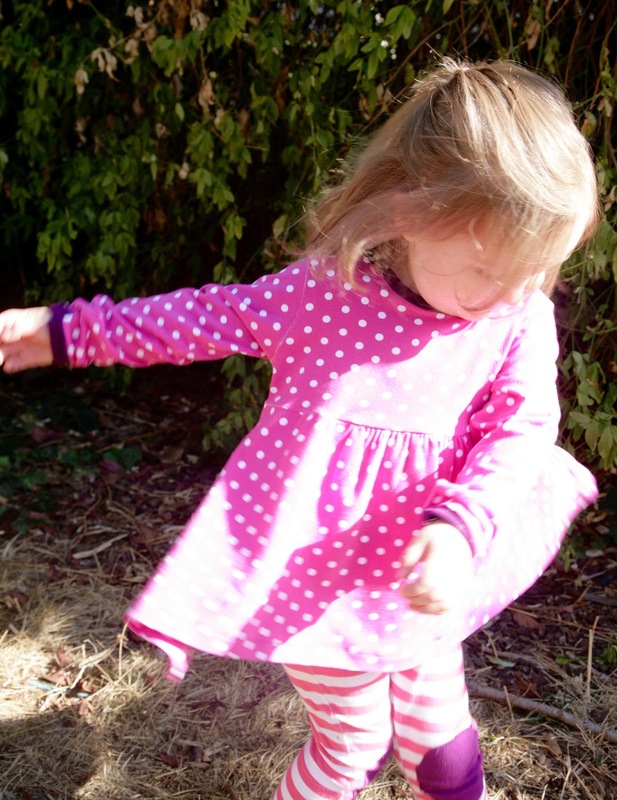 These are patterns #11 and 12, the "Arctic Summer Tunic" and "Tiny Path Leggings." The tunic is gathered across the center front and back with clear elastic, and has a straight, rather than curved hem, which makes it drape longer at the side seams. 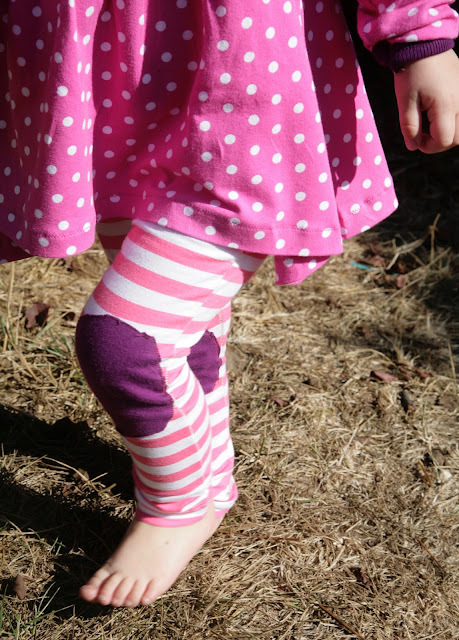 The leggings are a basic two piece (front and back) legging with adorable knee patches, which are completely useless but seriously freaking adorable. I think I'll be adding knee patches to future leggings! I sewed this in a size 92, which is the equivalent of 2T as far as I can tell. Ottobre Magazine patterns each have a size range, with an obvious separation between baby, little kid, and big kid patterns. 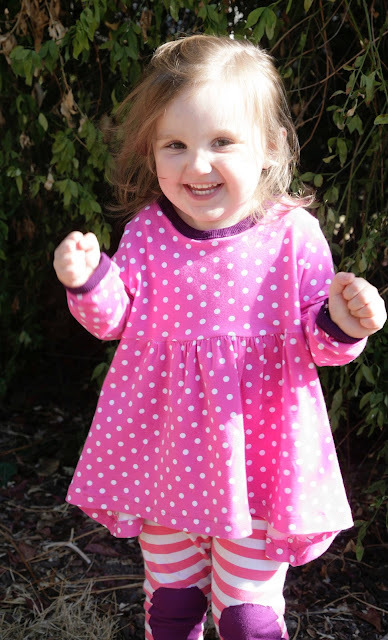 Many of my favorite cute little girl patterns start at size 92, with the smaller items being more babyish. This was a little bit of a problem because Maggie is so small for her age and the patterns that fit her veered on too baby-in-diapers-ish for my potty-trained preschooler. 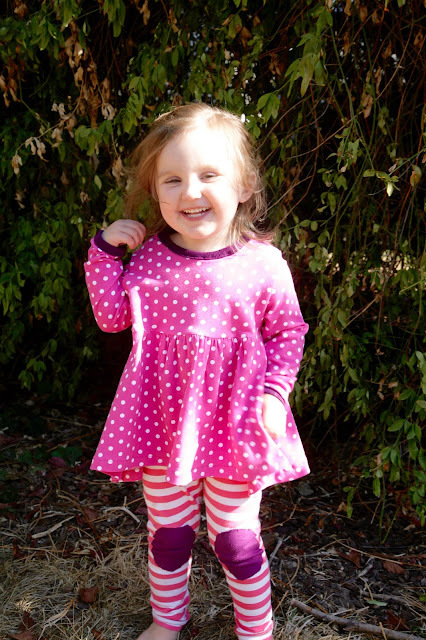 This tunic and leggings are both a little big on Maggie, but definitely wearable. This opens up a lot more options for her! Made up in these fabrics, this is less Hanna and more Disney, for sure, but Maggie is absolutely delighted, so I can't really complain. This girl sure loves her pink! I did have to talk her into using purple for the accents rather than even. more. pink. I'm glad I won that argument. 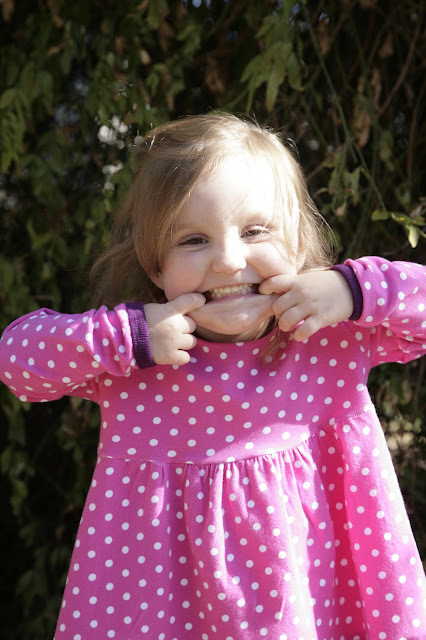 Asking your child to make funny faces is a sure way to get them in a good mood for a photo shoot! I used some stash jersey for the knee patches, and this really great bamboo ribbing from Stonemountain for the neck and wrists. Since I started sewing knits, I have struggled to find good ribbing for necklines and wrists. 100% cotton ribbing may be super soft and nice but it has terrible recovery and waves and stretches out all over the place. Thick sweater ribbings are inappropriate for kids' clothes. For a long time, Stonemountain only carried decent lycra ribbings in black or white, which is just boring. So I often used stretchy cotton-lycra fabric instead of ribbing, and that was fine, but the search for colorful quality ribbing continued. Online shopping for knits is especially dangerous because you just don't know what you'll end up with, and I had some big fails in that department. Recently, Stonemountain started carrying this bamboo ribbing in a variety of colors. It seemed to have the right amount of "pop" for my purposes and best of all, comes in bright fun colors. I bought a small piece of this purple, and I am thrilled to report that this stuff is awesome! It has just the right amount of stretch with excellent recovery and it's not too bulky. It is really stretchy but then it just pops right back into place. I lurrrrve it. (You know you're a sewing geek when you fall in love with ribbing.) I've been buying a yard in every color! I love it! The wrists are lightly gathered with clear elastic before the binding is applied, which makes for an especially stretchy and nice finish. Again, I followed the Ottobre instructions for binding the neckline and wrist seams, and I'm so happy with how it turned out. Next time, though, I will ignore the instructions to completely bind the sleeve bottom before sewing the underarm and side seams. I just don't have the serger skills to pull that off nicely and my wrists are a little mismatched right at the binding. Next time I'll sew the binding on flat but finish it in the round. It's not a noticeable issue, however. The straight hem makes this little tunic especially easy to finish and there is a soft "v" at each side seam which is really cute. I broke my twin needle making Joe's Rowan hoodie, so I just used zig-zag on this outfit, with no walking foot or anything, and it looks totally fine. In my experience, zig zag hems are less likely to pop than twin needle finishes on edges (like legging hems) that are under a lot of stress. One of these days I will try using stretchy thread in my bobbin like Rachel does ... that might help with that. In the meantime, I will sing the praises of the humble zig-zag stitch, especially on childrens' playclothes. As far as a walking foot, sewing knits is such a "feel" - I seem to have gotten a lot better at moving the fabric under the pressure foot without stretching it out too much. For fabrics with good recovery like these, I find I don't need any special setup on my sewing machine. Kaufman's Laguna jerseys curl quite a bit, I find, but are forgiving to sew. Wavy hems steam right back to flat under a hot iron. The Riley Blake jersey is less curly and even more forgiving. I would strongly recommend both of these knit lines for folks learning to sew on knits. I've now sewn with them a TON and they are the right weight for casual t-shirts and kids' clothes. 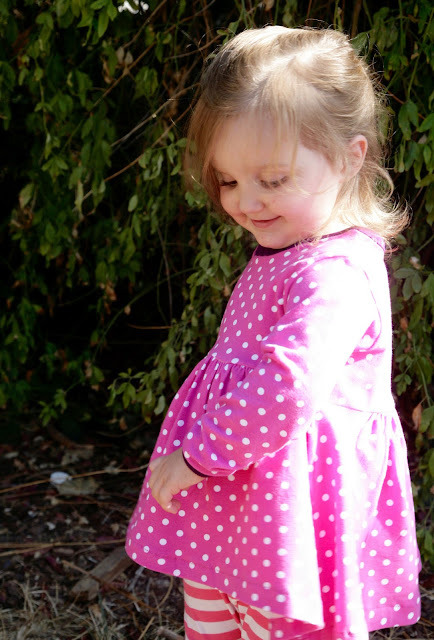 The skirt has a little twirl factor, which is always a win with the little girls! 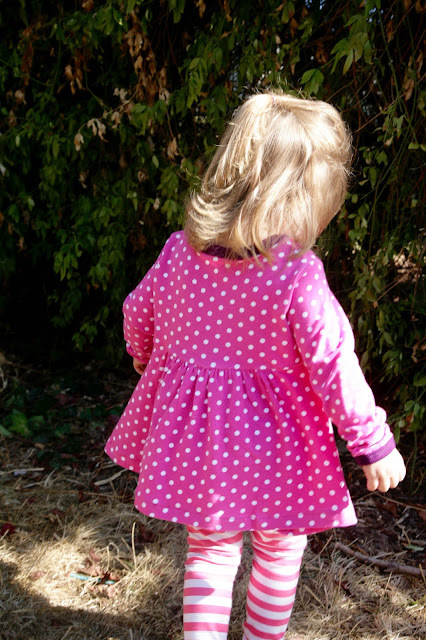 This is such a practical ensemble for a little girl. You could make a whole wardrobe of these. I probably won't do that, simply because there are too many other patterns I want to try! But you definitely could! And although it's about 500X more pink than I would prefer (GAG), Maggie loves it, and that's really what matters. I will continue to try to convert my children to mustard yellow, but in the meantime, it's great to see Maggie excited to wear something mama made. I can make mustard yellow things for myself! I have a couple more items on this sewing queue to make up before I start working on my next queue! Next up, sewing for the husband! EEK! What's on your sewing queue? It is a super-cute outfit, and still has a Hanna vibe even with all the pink (and purple - good job!). Thanks for the tip on ribbing from Stone Mountain - I, too, have been on the hunt. I will have to go check it out (you know you're a sewing geek when a rainbow of ribbing suddenly lands at the top of your Christmas wishlist!). This outfit is so adorable! I love the knee patches on the leggings! I have never gotten an Ottobre magazine and I'm convinced I need to get my hands on one. Very cute despite all the pink! The stripes and knee patches make it. Excited to hear about the bamboo ribbing - will look for it next time I'm at Stonemountain. Also I think Sanae blogged that she uses a zigzag stitch for hems too! Very sweet outfit, even in eye-popping pink. The top is a really nice style on Maggie. I picked up a couple of Ottobres in an op-shop for $1 each a while back and have been (fruitlessly) searching for more such bargains ever since - I agree they are a great sewing resource. Next on my sewing list: sunhat for R. Not terribly exciting, but last year's hats are a little tight now. Sweet portraits of Maggie -- she is so cute and obviously very proud of her swanky mama-mades! 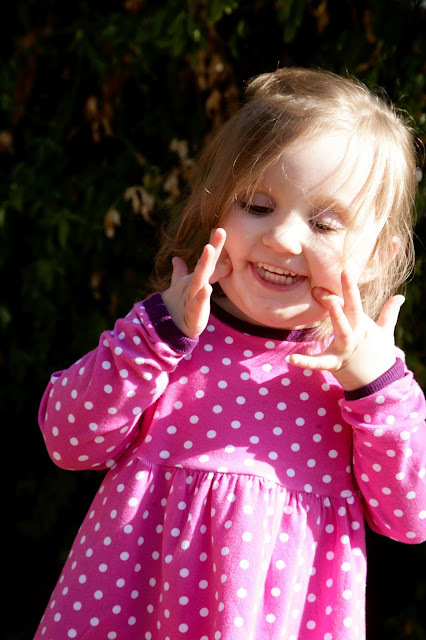 I LOVED it when Rowan was wearing size 92 and 98 and I was sewing a lot from my Ottobres -- if I was willing to trace up or down one size, the ENTRE range of baby/little kid clothes was available to us! I love this outfit! Comfy, cute, and a fun mix of colors and patterns. And thank you for the ribbing leads. I've avoided ribbing and just used cotton lycra like you, but maybe the time has come to move on! Wow Maggie, that sure is pink! But it suits ya!